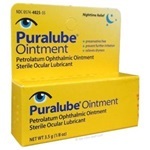 Sterile Altalube eye ointment containing white petrolatum/mineral oil 15-85% in 3.5gm tube. 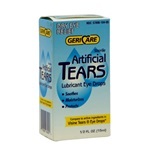 Relieves dryness of the eye and prevent further infection. 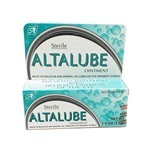 Manufactured by Altaire. NDC Number: 59390-198-50. Comes as singles. 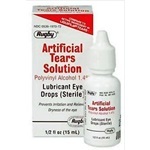 Lubricating artificial tears solution 1.4% in 15mL dropper bottle. Active ingredient is Polyvinyl alcohol. NDC: 0536108494. Manufactured by Major Pharmaceuticals. Comes as singles. 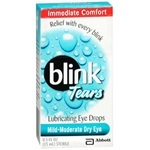 Blink tears are sterile lubricating eye drops Polyethylene Glycol 400 0.25%, in a 15 ml dropper bottle. Mild-moderate dry eye symptom relief. Manufacturer: Abbott. Comes as singles. **THIS ITEM IS CURRENTLY ON BACKORDER. 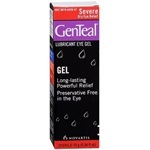 ** Genteal is sterile lubricating Hypromellose eye gel 0.3%, in a 10 gm tube. 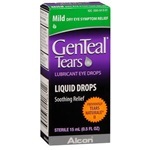 Severe dry eye symptom relief. Manufacturer: Novartis. NDC: 00078042947. Comes as singles. 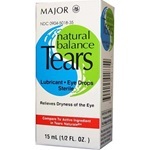 Natural Balance Tears artificial tears Hypromellose 0.1%/0.3% ophthalmic drops in 15 mL dropper bottle. Manufactured by Major Pharmaceuticals. NDC Number: 00904-5018-35. Store drug at USP controlled room temperature. Comes in singles. **THIS ITEM IS CURRENTLY ON BACKORDER. ** Refresh Celluvisc is sterile lubricating eye gel-like drops using Carboxymethylcellulose Sodium 1%, in single 0.4ml droperette vials. Preservative free. NDC: 00023-4554-30. Manufacturer: Allergan. Comes 30 dropper vials per box. 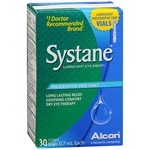 Systane is sterile lubricating eye drops containing Propylene Glycol/Polyethylene Glycol 400 0.3%/0.4%, in single 0.7ml droperette vials. Preservative free. NDC: 00065043133. Manufacturer: Alcon. Comes 30 dropper vials per box. **THIS ITEM IS CURRENTLY ON BACKORDER. 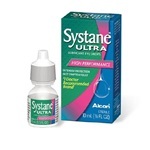 ** Systane is a sterile lubricating Hypromellose eye gel 0.3%, in a 10 gm tube. 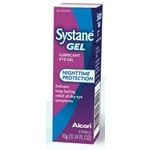 Overnight protection delivering long-lasting relief of dry eye symptoms. Manufacturer: Alcon. NDC: 00065047401. Comes as singles.